A current focus of the group is on the light rail corridor in Pyrmont. We aim to create an area for native birds, butterflies, lizards and other native wildlife, by replacing weeds with plants that would have grown here before white settlement. 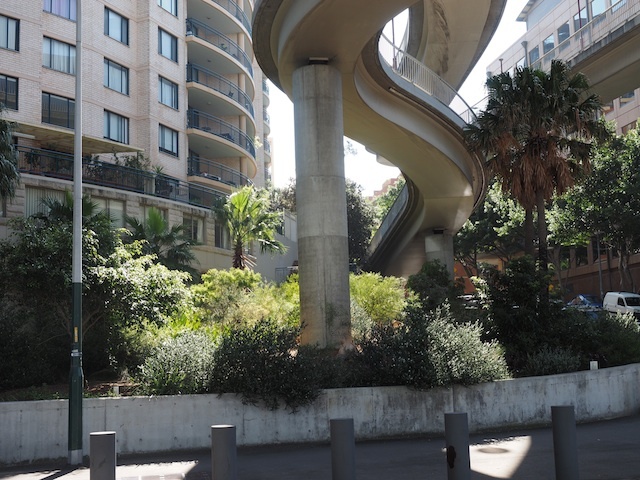 The corridor runs along three sites maintained by Landcare: alongside Saunders Street, the Fish Market Light Rail Stop and both sides of the walkways leading to the Wentworth Park Light Rail platform. FISH MARKET LIGHT RAIL STOP: This once neglected, rubbish strewn area, now displays mature native flora including wattles, grevilleas, westringias and hibbertia ground cover. JONES STREET POCKET PARK (Trina’s path): Nestled behind Miller Street and crossing the light rail bridge into Saunders Street is the Jones Street Pocket Park walkway with its glorious sandstone cliff backdrop. The Landcare group has planted and maintains this site, regularly mulching, weeding planting the area. It is a showcase of wattles, blueberry ash, westringias and other native plants. It has become a habitat for blue tongue lizards, lorikeets, kookaburras and magpies. QUARRY MASTER DRIVE: The area on the corner of Quarry Master Drive and Bank Street, set beneath the spiralling pedestrian ramp of the Anzac Bridge, and adjacent to apartments blocks, was once the site of heavy sandstone quarrying. Here the Landcare group has planted hardy native species to withstand the dry, inhospitable conditions and with a nod to the past a few sandstone blocks are placed throughout.